How best to approach a wild horse? Or one sleeping soundly in her stall? Is it with a “soft eye,” as our friend the horse trainer Yoritasan explained in Hokkaido, looking at us indirectly, with something like the opposite of a stare? Is it slowly, after standing still in an equine field of vision for some time with one leg bent, mimicking the posture of a horse at rest, unthreatened, unthreatening? Is it with gifts of grasses or hay, offerings of friendship, promises of goodwill and benign intent? Charlotte Dumas’s approach is a way of being—present, focused, curious, open. She uses large-format film, and working with such film and moving subjects takes exceptional mastery and impeccable instincts. Dumas improvises with timing and ever-changing light, those unknowns that travel itineraries and careful production schedules can never predict. She goes to the animals that she photographs where they are, in their territories and homes. For the project chronicled in this book, Dumas traveled over the past two years across Japan from Yonaguni and Miyako islands to Nakanoshima in the south; to Nagano, Tsushima island, Cape Toi, and Ehime prefecture; and to Hokkaido, in the cold, far north. 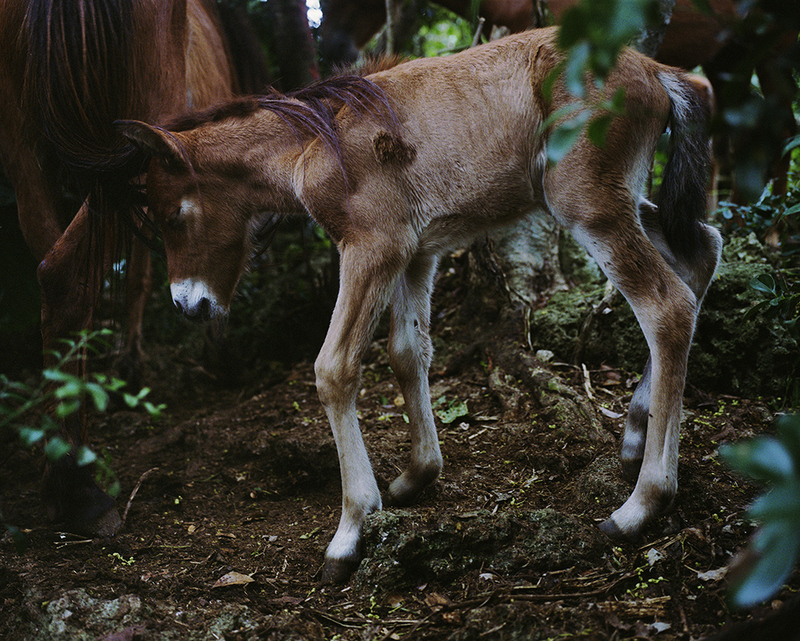 Each of the eight breeds of Japanese horse she found—the Yonaguni, Miyako, Tokara, Kiso, Taishu, Misaki, Noma, and Dosanko—has their own story, landscape, relationship with humans, and spirit. Each had to be met in the place they lived. Dumas’s incredibly detailed portraits are as much about these horses as they are about the places they come from. To approach Nakanoshima, one must take a seven-hour ferry through the East China Sea overnight. Our trip began quietly in Kagoshima in May 2016. A rainbow over the Toshima, our ship and the name of the rare horse breed we were seeking, offered a promise of discovery. Two hours south of the great and lively volcano Sakurajima, the waters began to churn. For five hours in the darkness of the open sea, the Tokara jumped and bucked, tossed and crashed. In the gray dawn, the waters calmed and we made our way to the deck. Nakanoshima, mysterious and remote yet continuously inhabited for 3,000 years, was before us, shrouded in clouds. Shore-birds and flying fish took to the air as we arrived to the island that has no restaurants, no stores, one hundred people, two bathhouses by the sea, about a thousand wild goats, countless migrating songbirds, and twenty-three of the last living Tokara horses. We stayed for little more than twenty-four hours, but on the morning we were to leave, Dumas found the raven-black mare Corona in a bamboo forest on the side of a mountain. Her foal, as yet unnamed, waited below as Corona paused her chewing for a portrait. 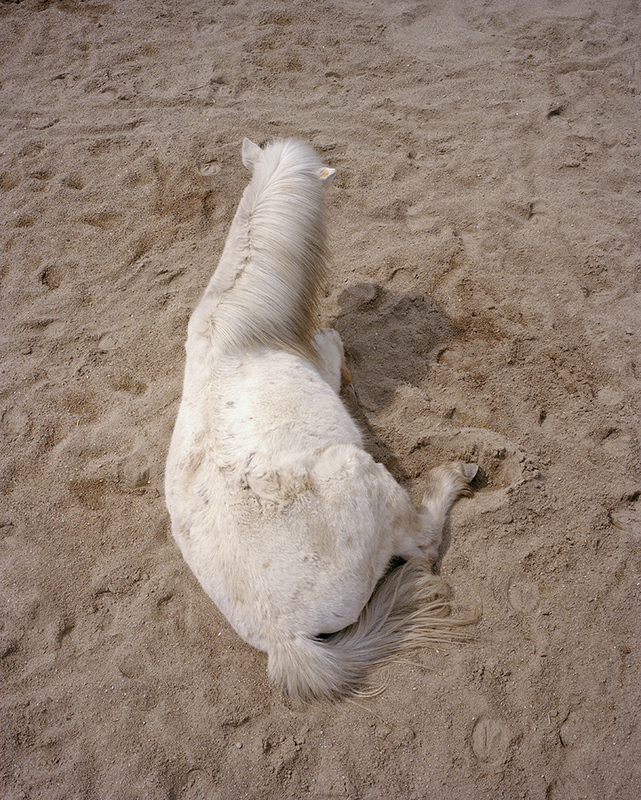 On a hot, tropical morning on Miyako-jima in April 2015, Dumas photographed a playful Miyako horse in the bright sun by the turquoise sea of the southernmost reaches of Japan. After that, we flew all day, heading north to Hokkaido. On our flight’s approach to Hakodate, we put on down coats and wool hats. In Hokkaido, we found the Dosanko horse in forests under Mt. Komagatake. The horses are the color of snow, or brown and white like birch trees. They are thriving. I was approached on Yonaguni island in April 2015. 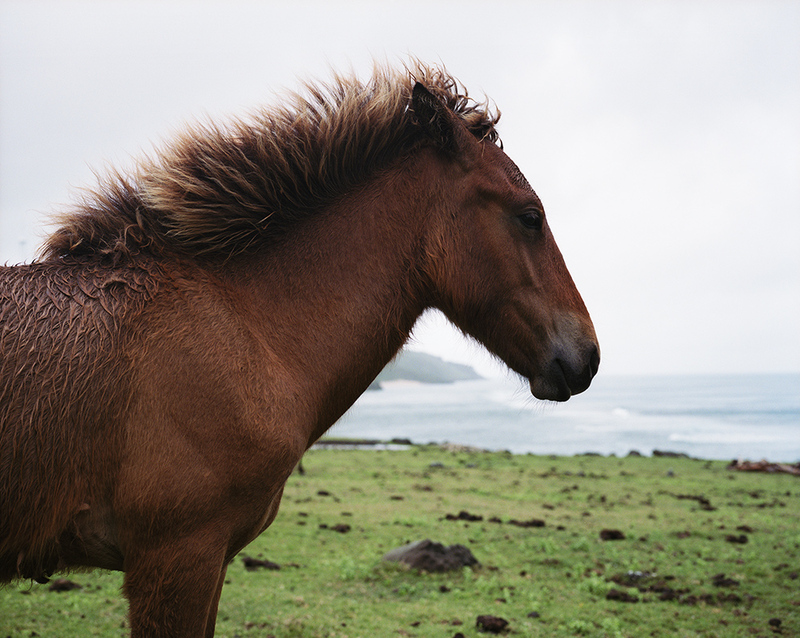 As the sun was rising over the sea and Dumas was photographing one of the semi-wild Yonaguni horses about thirty yards away, I heard the sound of tiny hooves on the road behind me. Standing quiet and still, I was soon surrounded by five or six small horses. They made a circle around me and gently fell asleep. When we arrived on Cape Toi in May 2016 to meet the semi-wild Misaki horse, we were first given a warning at the gate of their protected reserve: a diagram of a maniacal horse that shouted “BITE! KICK!” We were cautious therefore when we made our first approach to the largest Japanese native horses we had met so far. We didn’t experience any biting or kicking—but then I went to the car alone to get our team’s mosquito spray. As I was walking back, I heard a person’s loud footsteps behind me. When I turned no one was there. We were with ghosts, and the horses, who didn’t engage with us at all as we followed small bands of them up the steep mountains and around the abandoned hotels in the park, must have thought we too were ghosts. The ancient Greeks and Romans who wrote about horses, Xenophon, Varro, Vergil, Nemesian, Palladian, among others, measured their quality by things like the shape of their legs and ears, the size of their bellies, the texture of their coats. But what of the soul? 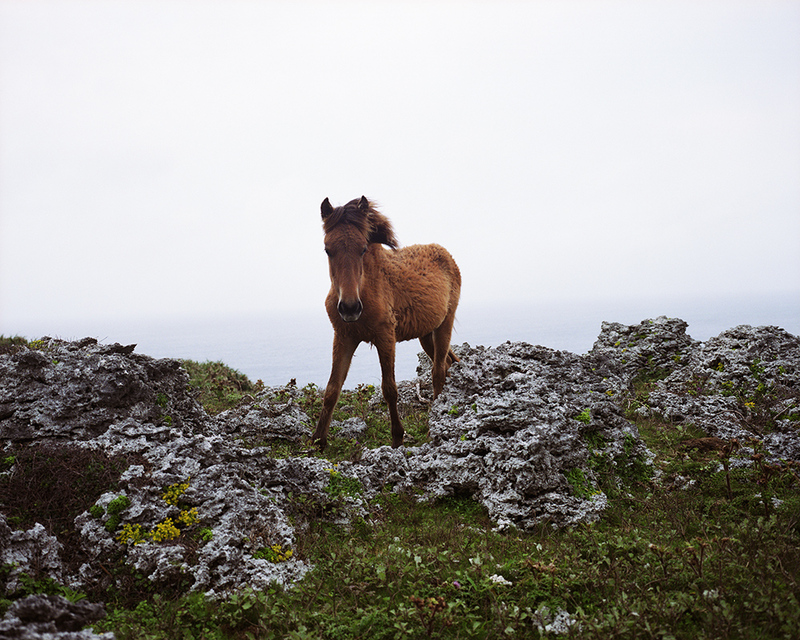 On Yonaguni island, Dumas spent nearly an hour with a juvenile horse who seemed to be captivated by the sea. He stood with a soft breeze in his mane and followed the waves with his eyes. Was he dreaming of another place? Was he recounting his life so far on the cliffs of his island home, soon to be radically altered by the construction of Japan’s first new military base in forty years? Was he listening to the sound of water on rocks in a place where Japan would soon be aiming its newest radar station toward China? It was after Dumas traveled to Nagano in April 2016, that the intuition I have felt since I first saw her work, many years past, was proved in a portrait. A storm was approaching, but the clouds held their rain for an hour or two, enough time for her to follow a few Kiso horses around the village where they live freely, going and coming from their stalls on their own whims. She found one mare at rest, and in her portrait, if you look very carefully, you can see in her sparkling brown eye a reflection of Dumas herself. Dumas doesn’t see horses as objects, nor use them as props to make nice pictures. She creates portraits that burn into the soul because when she is looking at the horses, they are looking back. It is my belief that the disappearance of the actual presence of animals as a given in our society greatly affects our ability to be empathetic with one another and how we experience life in general. The gap that currently exists between animals used and seen as a food resource on one hand and the anthropomorphic use of them on the other (as they are also often depicted in visual language) contributes to an increasingly contradictory relationship. When it comes to animal topics, emotions often run high. It seems the less we are in direct contact with them, the more we lose the perspective of their true capacity and the depth of what they mean to us and we to them. For over a decade, I have been observing different animals, mainly horses and dogs but also wolves and tigers, within specific situations and always in relation to people. I’m particularly interested in the complexity of how we define value when it comes to animals as well as how we attribute value to our selves and others. Ultimately it’s the context of my subjects that defines each of my subjects. Born in 1977. Dutch photographer. After graduating from Gerrit Rietveld Academi, she studied the visual arts at Rijks Akademie. 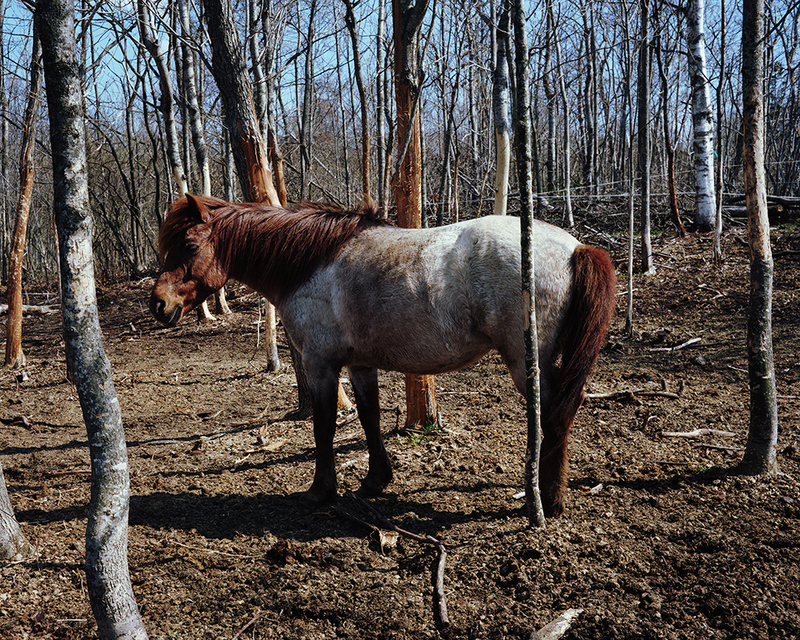 Throughout her career, she focuses on the relationship especially between human and animals in contemporary society and has exhibited portraits of animals situated in a variety such as police horse, rescue dog, and animals kept in zoo. She has been participated in a several group shows and held solo exhibition mainly in Europe and the United States. Currently based in both Netherland and New York. The culmination of a project to document Japan's native horse breeds, this book contains around 60 portraits of the eight remaining breeds around the country. From Dosanko to Kiso, Noma, Tsushima, Misaki, Tokara, Miyako and Yonaguni, how have the native ponies surviving in Japan since the earliest times been involved with people in these places, and how have they added value to their lives? For her latest endeavor, Charlotte Dumas journeyed to all eight locations to trace the history of these fascinating animals, and capture their everyday lives in intimate detail.